Until now, the My Nintendo service offered rewards such as in-app items, wallpapers, and exclusive discounts. Nintendo has now told fans that it is updating the My Nintendo service to reward gamers in an exciting new way. Starting early March, you can use the My Nintendo gold points that you have accumulated to buy Nintendo Switch games in the eShop. You earn the gold points by purchasing games. Nintendo has promised to bring the update to users in North America, Europe, as well as Japan. It will be a major step forward from the existing rewards program. You earn gold points every time you buy Nintendo games from the eShop or brick-and-mortar retailers. Starting early March, you’ll be able to buy new Nintendo Switch games without paying a dime out of your pocket if you have enough gold points. The program will particularly benefit power users who frequently purchase new titles and accumulate gold points in the process. You’ll earn gold points worth 5% of the amount you pay. You can redeem those points when buying your next game for the Nintendo Switch from the eShop or even Nintendo.com, said the company. If you don’t have enough gold points, you can pay the difference with any other payment method. For example, if you spend $100 to buy a new Nintendo Switch game from the eShop, you’ll earn 500 gold points worth $5 (that 5% of $100). You can use these points towards your next purchase to get a discount or buy a game for free if you have enough points. You may have to buy tons of games on the eShop to have enough points to be able to purchase a full game using nothing but the gold points. 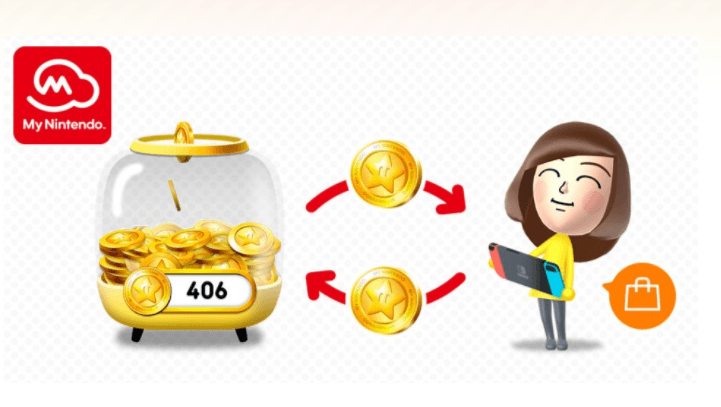 Nintendo said the gold points would be good for a year once earned. For instance, if you earn points in March 2018, these points will remain valid through the end of March 2019. The Japanese company had experimented with the idea last year with Wii U and 3DS titles, but it was a temporary promotional campaign. The new reward program would help boost Nintendo Switch’s software attach rate. Meanwhile, Nintendo has added 13 new games to the Nintendo Switch eShop this week. They include Dragon Quest Builders, which is a sandbox adventure that allows you to craft different objects to rebuild the world of Alefgard. The Switch version of Dragon Quest Builders has additional crafting options that you won’t find in the PS4 version. It also has an exclusive Great Sabrecub mount. Other games released this week include classic Arcade Archives titles 2020 Super Baseball and Crazy Climber, along with Disc Jam, Mercenaries Saga Chronicles, Dandara, and a free demo of Pic-a-Pix. Next week, Nintendo is set to release Owlboy, Xeodrifter, The Longest Five Minutes, Fe, and Bayonetta 2. Nintendo Switch now has a huge library of exciting first- and third-party titles to keep gamers hooked. Nintendo rarely offers discounts on its gaming titles. The company is running a massive sale on the eShop currently. For a limited time, you can buy some great titles such as Rocket League, Golf Story, Perception, Inversus Deluxe, Super Beat Sports, Stikbold: A Dodgeball Adventure Deluxe, and others. All of them are selling at a discount of 10% to 50%. If you have any of these games on your wishlist, now could be a good time to buy them. Nintendo confirmed last week that it would bring its Nintendo Switch Online subscription service in September 2018. The service was originally expected to be rolled out in 2017. The Nintendo Switch Online will allow you to play online with your friends and get access to select classic games. The Japanese company has already been offering the online multiplayer service for free since March 2017. It will remain free until the paid service rolls out in September. The free service has a lot of limitations, though. The paid Nintendo Switch Online service will cost $3.99 per month. The cost is $7.99 for three months and $19.99 for a year. Nintendo’s online service is far more affordable than Sony’s PlayStation Plus and Microsoft’s Xbox Live Gold. Nintendo is also bringing a set of DIY cardboard accessories called Labo to expand its addressable market. The family-friendly Labo will give kids a hands-on experience when playing games on the Nintendo Switch. In less than a year of launch, Nintendo Switch has surpassed the lifetime sales of Wii U. The hybrid console sold 14.86 million units in ten months of launch, beating the Wii U’s lifetime sales of 13.6 million units. Nintendo sold 7.23 million Switch units during the holiday quarter alone. The company claims Switch’s sales momentum is even better than that of Wii, which shipped more than 102 million units in its lifetime.